• Sitemap • Map To Our Location • Email Us! Is Micro Point Solutions an extension? Micro Point Solutions does offer an extension called Micro Point Accents. This is the healthiest hair volumizer in the industry today. You can use Accents to volumize and create more density for short or medium length hair, or if you have long hair, receive Micro Point Accents to volumize your hair. Micro Point Accents come in two lengths – 10 or 18 inches. 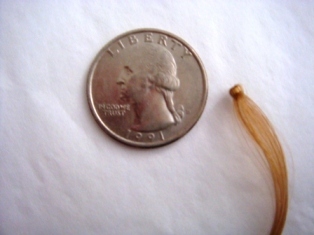 Micro Point Accents are very light in weight and will not pull your own growing hair when it is wet or dry. Will the Micro Point Solutions procedure be painful? The Micro Point Solutions procedure is not painful. Some of our clients say their scalp feels a little tight right after the procedure, and this feeling lasts for no more than a couple days. How long will my Micro Point Solutions procedure take? Time is based on how thin your hair is and how much of the Micro Point Solutions product your consultant feels you need to give you the look that you are seeking. Your certified Micro Point Solutions consultant/technician customizes the procedure to give you the type of volumizing you are seeking. Can anyone benefit from the Micro Point Solutions procedure? Nearly everyone can benefit from Micro Point Solutions. Those with thinning hair can especially benefit. It is recommended that you arrange for a consultation with your certified Micro Point Solutions professional to see what Micro Point Solutions can do for you. How much hair must I already have to do the Micro Point procedure? Anyone experiencing 0-50% hair loss may be a candidate. Again, it is so important to meet with your Micro Point Solutions professional for a consultation. How much hair density can I get with Micro Point Solutions? Once you are qualified by your Micro Point Solutions professional, you can receive as much density as your existing hair will allow. Remember, with Micro Point Link, you can volumize your hair by 400%. With just one Micro Point Accent, you can volumize ten of your hairs by 100%.